The 2016 European Open golf tournament on the European Tour is taking place this week from September 22-25, 2016, on the Beckenbauer Course at the Golf Resort Bad Griesbach located in Rotthalmunster, Germany. Here is a list of the prize money up for grabs for the European Tour players to win at the 2016 European Open. The European Open golf tournament dates back to 1978 when American Bobby Wadkins was the winner. American Tom Kite won this tournament in 1980 and they are the only two Americans to win the European Open but a slew of Americans are playing in 2016. That list includes David Lipsky, Chase Koepka, Paul Peterson, Charlie Danielson, Lee McCoy, Bud Cauley, Luke List, Matt Every and Daniel IM. The European Open was not played from 2010-14 but was brought back to the European Tour last year. Golf greats like Greg Norman (1986), Ian Woosnam (1988), Nick Faldo (1992), Bernhard Langer (1985, 1995), Lee Westwood (1999, 2000), Darren Clarke (2001), Retief Goosen (2004) and Colin Montgomerie (2007) have all won this event. The total prize money up for grabs at the 2016 European Open is $2.232 million. All prize money below for the 2016 European Open golf tournament has been converted from Euros to American dollars at the current exchange rate of 1.12. The winner of the 2016 European Open golf tournament will earn $317,930. 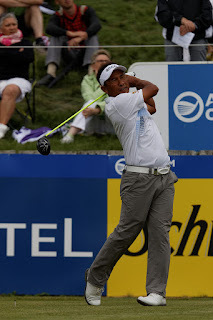 Thongchai Jaidee from Thailand (pictured above) was the winner of this European Tour event last year. Second place at the European Open is worth $247,953. Graeme Storm from England finished alone in 2nd place at this European Tour event last year. Third place is worth $139,698 at the European Open golf tournament. Pelle Edberg from Sweden finished alone in 3rd place at this European Tour event last year. Fourth place at the 2016 European Open is worth $111,580. Has the United States or Europe Won the Ryder Cup the Most Times?